Sue Owen, second left, and the winners of the Diversity and Equality Awards 2014. I’d like to start by saying a big well done to all those who took the time to prepare nominations in the Civil Service Diversity & Inclusion Awards 2015 and congratulations to all 35 nominees who were shortlisted! A special mention goes to the Home Office for managing to get 8 entries shortlisted - the competition was very tight and all the finalists did remarkably well to reach this stage! 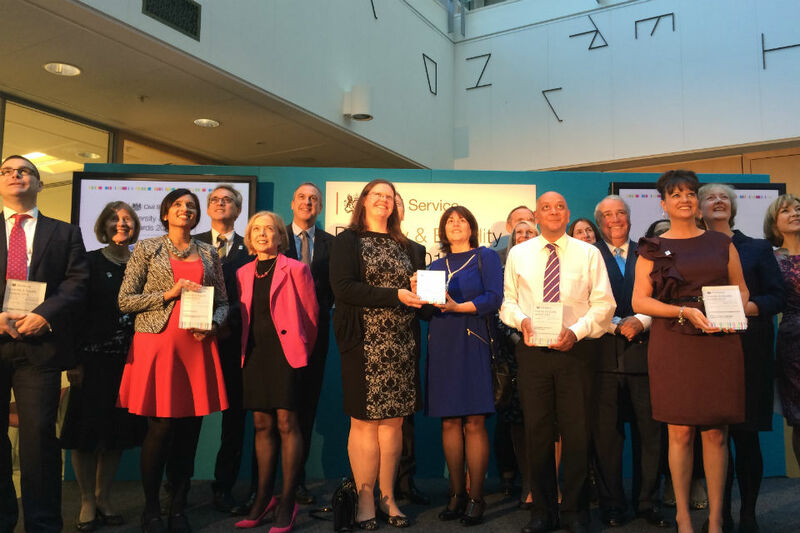 This year we added some new categories with awards for each of the key diversity and inclusion themes including gender, disability, ethnicity, LGB&T, employee networks, service delivery and overall inclusion. The judges were extremely impressed with the high quality of the submissions, which made the job of selecting the shortlisted nominees especially difficult. I found it truly inspiring to read about the fantastic projects going on around the country. A brief synopsis of each of the shortlisted entries is now available on the Awards website for you to see. The shortlisted finalists will be invited to a reception on 29 September to recognise the effort that each of them put into their work. And of course, they will also be invited to the awards ceremony which will take place on 13 October, hosted by HMRC, at 100 Parliament Street, London. Thanks to Dods who are organising these events and for supporting the Civil Service Diversity and Inclusion Awards for the 9th year in a row. Congratulations once again to those who made it onto the shortlist and good luck for the next stage! If your project didn’t make it through this year, please keep going with all the hard work you do and I encourage you to give it another go next year. For those of you on Twitter, you can keep up-to-date on the awards and see instantly as the winners are announced by using the hashtag #championdifference. How do you know if your policy is working?